Henry (often known as Harry) Hudston was born in Beeston on 18th February 18872, the youngest of sixteen children of James Charlton Hudston (b. 1843, Beeston) and Mary Ann, his wife (b. c1847, Bangalore, Madras, India). James and Mary had married in Bangalore in 1861, aged 18 and 14 respectively, while James was serving with the 102nd Regiment of Foot (Royal Madras Fusiliers) in Madras. The couple had at least four children by the time James had left the Army, in about 1871, and settled back in Beeston, where at least twelve further children were born to the couple. There, James began work as a lace maker and that was the case in 1901, when he and his wife, six of their children and a grandson were at 76 Upper Regent Street, Beeston. By then, the 14 year-old Harry had started work as a cotton stripper in the lace trade.3. By 1911, James, his wife and two adult children - including Henry, then a lace maker - were living at 33 Bramcote Road, Beeston. James was then described as a Levers lace maker4. As Henry's Army Service Record has not survived, we do not have a precise record of when he enlisted, but we do know that it was probably in February 1915, with the 9th Battalion, Northumberland Fusiliers5. This battalion had been formed in Newcastle as part of Kitchener's Second New Army in September 1914 as part of 52nd brigade in the 17th Division. Henry would have joined the battalion to start his training at Wimborne in Dorset, later moving to Wool, Dorset and Hursley Park, near Winchester in Hampshire. It seems likely that he was with the battalion when it left for France on 15th July 19156. In the summer and autumn of 1916, as part of 52nd Brigade, 17th Division, the battalion took part in a series of Somme battles, starting with a successful attack from Quadrangle Trench on the 5th July, although there were inevitable casualties. A further attack on 7th July, met sustained opposition and essentially failed with heavy casualties. During August, the battalion was involved in attacks in the vicinity of Delville Wood, which largely failed with heavy casualties. After seeing only occasional action during September and October, on November 1st the battalion entered trenches opposite Le Transloy as part of offensive preparation for the Battle of Ancre. By this time, conditions in the trenches were unbelievably bad, the worst that the battalion had encountered and, by the 7th November, were such that men became so trapped in the mud that each required four men to get them out. Although little as regards action - other than a British aeroplane trying to land 'in our trenches' - is recorded in the war diary for 9th November, the detailed record of casualties on that day does include 'Private 17066 H Hudson' - undoubtedly Private Henry Hudston.7. Private Hudston's body was never identified and he is commemorated on the Thiepval Memorial to the Missing which now stands adjacent to the Leipzig Redoubt. The memorial was unveiled on the 1st August 1932 by the then Prince of Wales and is the largest British War Memorial in the world. Standing 150 feet high, it dominates the surrounding area. The memorial stands on a concrete raft 10ft thick, built 19ft below the ground, the solution to the problems of building over the warren of tunnels that formed the German second line. Designed by Sir Edwin Lutyens the memorial has sixteen masonry piers, where can be found, on the panel faces, the names of some 72,000 British and 830 South African soldiers who died and have no known grave, during the period starting in July 1915, when the British Third Army took over from the French, through the Somme battles of 1916, until 20th March 1918, the eve of the last great German offensive on the Somme. 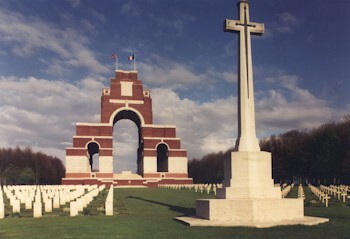 The focal point of the memorial is the Stone of Remembrance, which lies under the great arch and centrally between the piers, for which Rudyard Kipling chose a quotation from Ecclesiasticus, "There name liveth forevermore". Private Hudston was posthumously awarded the British War Medal, the Victory Medal and the 1915 Star8. Under the terms of his 'Soldier's Will', his mother was paid his financial effects of £3 12s 9d on 16 March 1917 and his War Gratuity of £8 on 6 October 19199. 2His birth was registered in Basford Registration District (of which Beeston was part) in Q2/1887 (Ref 7b 177). His full birth date was recorded when he was baptised at Beeston Parish Church on 11 May 1887. John's siblings were Sarah Ann (1863-1864), Mary Hannah (b. 1866), Frederick Charlton (b. 1868), James Henry (b. c1871), William David (1872-1873), Charlton Francis (1873-1936), Edwin Harry (b. 1874, Edward (1876-1962), Kate (1843-1933), Ruth (b. 1879), Lucy Ann (1880-1951) Eleanor (b. 1882), Frederick Baxendale (b. 1883), Sarah Ann (b. 1885, and Amy (1885-1886). 4Beeston, 1911 Census, Piece 20427 RD429 SD3 ED2 Schedule 304. 5The probable date of Henry's enlistment has been calculated from the amount of his War Gratuity. His medal card indicates that he may have first joined 2nd Battalion but this appears to be only for a short period. 6Details of the battalion's formation and training is from www.forces-war-records.co.uk/units/278/northumberland-fusiliers. However, the date of the battalion's embarkation, fully described in its war diary is at variance with the embarkation date of 1st June 1916 given on Private Hudston's medal card. It is therefore possible that he had first joined 2nd Battalion in France in June 1916 and was transferred to 9th Battalion prior to the 9th leaving for Egypt in October 1915. 7This account of the battalion's involvement in the Somme battles is derived from its war diary. 8Details from Henry's Medal Card - available on ancestry.com.